Normally avatars cannot go off the edge of a sim. But a simple trick will let you move your avatar off the edge. Even better, you can dance, walk, or fly! I made a set of sculpts and a nice demo of this effect in an off-sim dance floor. 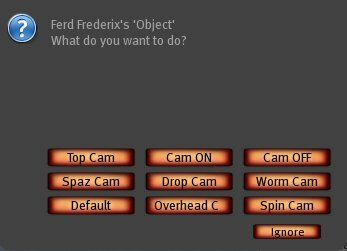 In addition, I've modified a camera control script that you can add to existing pose balls. 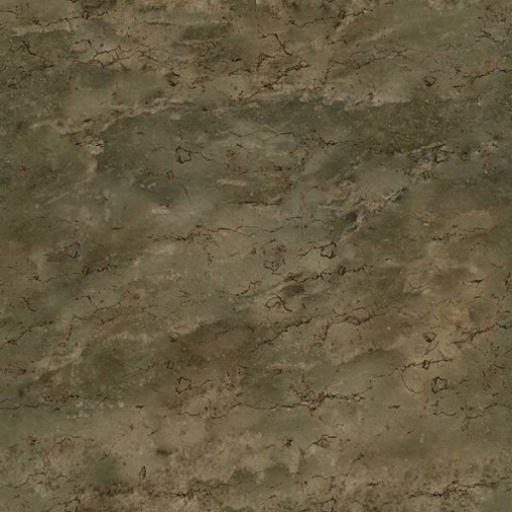 Save the following textures to disk and upload them to Second Life. Be sure to load them with the "Use Lossless Compression" option selected. 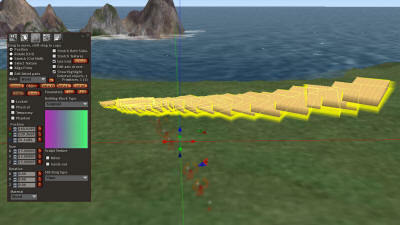 Start with a prim that is 15 X 15 X 15 meters in size. 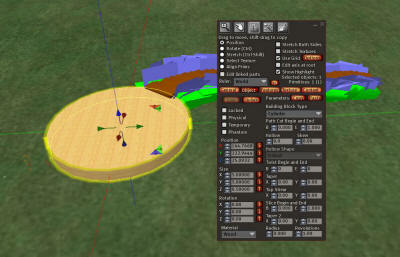 Set this prim to type = sculpt and set the sculpt Stitching type to Plane as seen in the photo below. Click any photo to view it larger. Press and Hold the shift key, then drag a copy of the staircase prim to one side to make a copy. Set the size of this sculpt to 30 X 30 X 30, and slide it under the stairs. 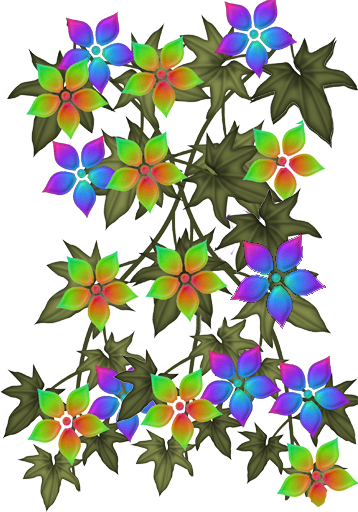 I have colored the prims so you can see how they fit together, the base is green, the flower box edges are blue, and the stairs are brown. Add a cylinder prim to the top end of the staircase. Set this prim to 5 X 5 X 0.l5 meters. You can fancy up the dance platform with rails, a dynamic blinking floor, or just leave it plain as I did. You will need to change the repeats on each piece to get the best effects. The dance platformshould have a 2X2 or small repeat on the top, and you should adjust the side repeat until you see squares that match. 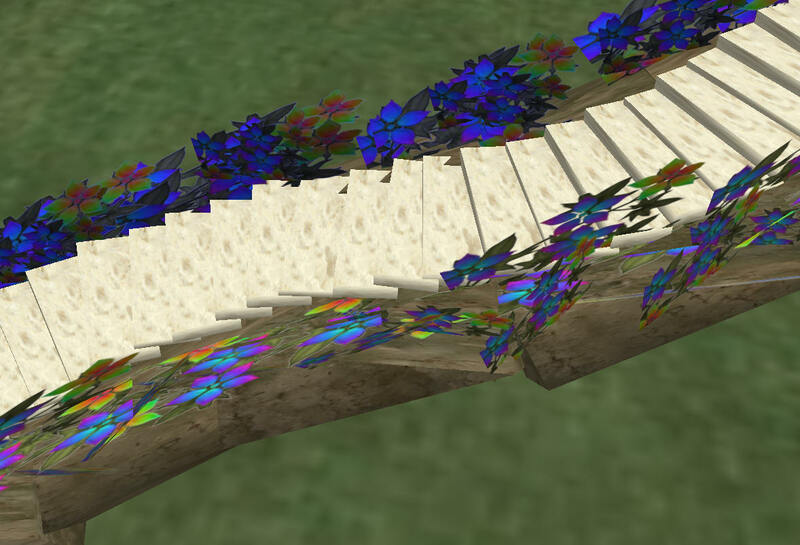 For the stairs, flowers and the base dirt, set the repeats on the textures to 128 H by 2 V. There is no offset. 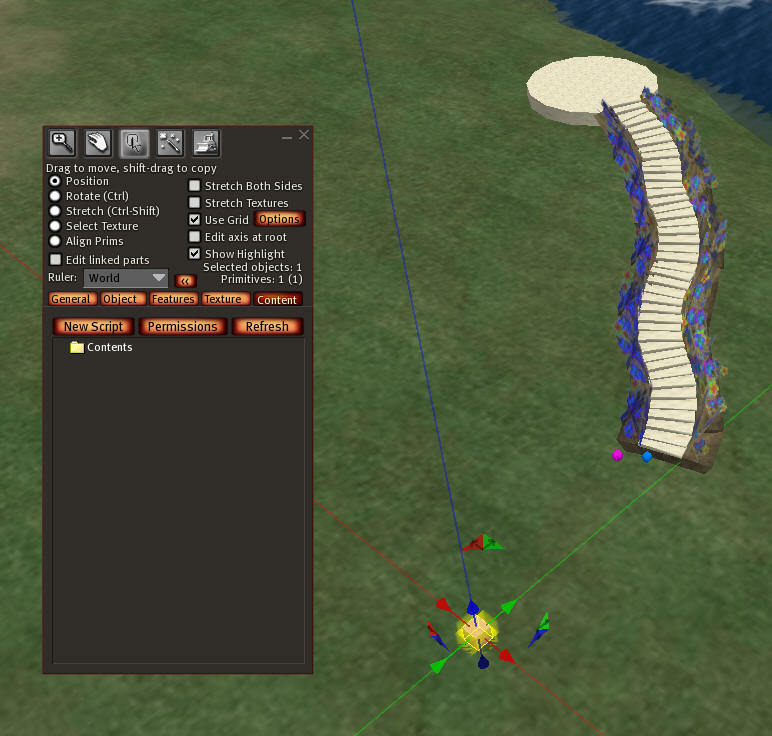 Press and hold shift and duplicate by dragging the entire staircase. Grab the copy and rotate it until is is at an angle of 270 degrees and extending the first set of stairs up into the sky. It should contnue on smoothly from the last step and curve to the left. Delete the lower dance platform. You only need the top platform. 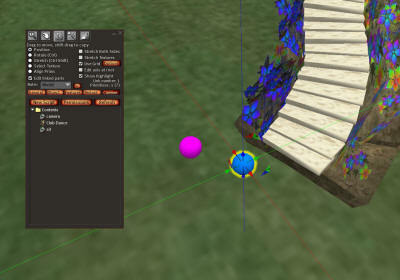 Add two spheres to the bottom of the steps. Color them pink and blue. Put the following two scripts into each pose ball. You also need to add one dance animation from your inventory. You can use a male and a female animation, or use the same one in each. The first script is the pose ball controller. Click to download it from my free script library. The second script is the camera controller. Click to download it from my free script library. 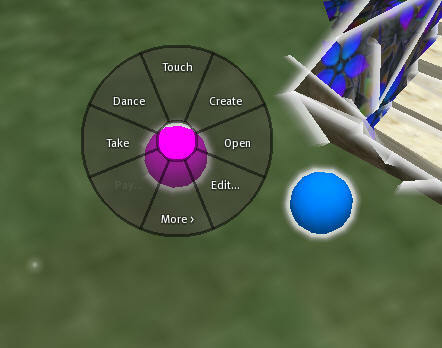 Put both scripts into both of the pose balls along with a dance animation. You will need to rotate the pose ball and position it so that your dance has you in the correct position. Note: I have deliberately left the pose balls unlinked at this point. When they are linked, you cannot easily adjust them. As unlinked, single prim objects, you can sit on them and move them and watch your avatar move. Your avatar will fly 28 meters away and will be out of camera range. Press ALT, hold it down, click the pose ball, and use your scroll wheel to move your camera back to find your avatar. It is probably pointing far off. 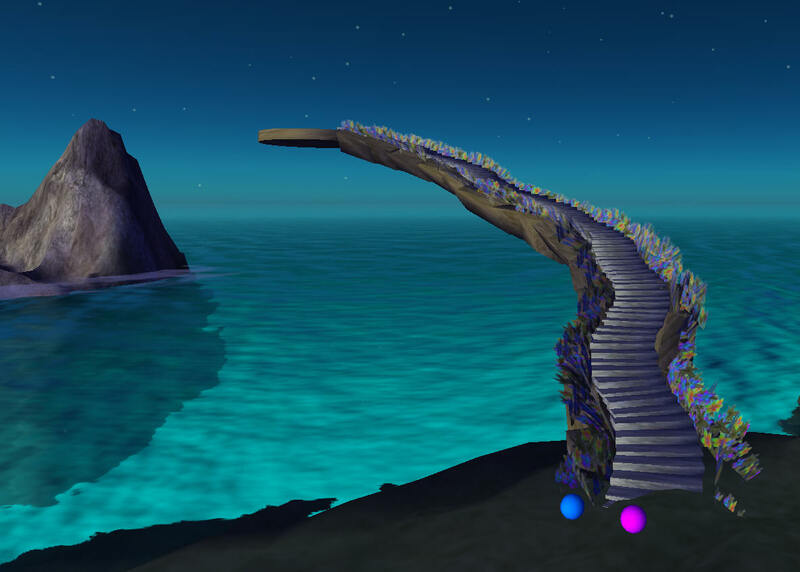 Now zoom back in, edit the pose ball, and rotate it until your avatar is in position above the dance floor. If you cannot get the heights or distance correct, you will need to change one line in the pose ball script. this moves you 'up' 8 and 'out' 28. Change the last two numbers and sit again on the pose ball. To move down, lower the last number, to move up, increase it. To move further out or in , edit the 2nd number. 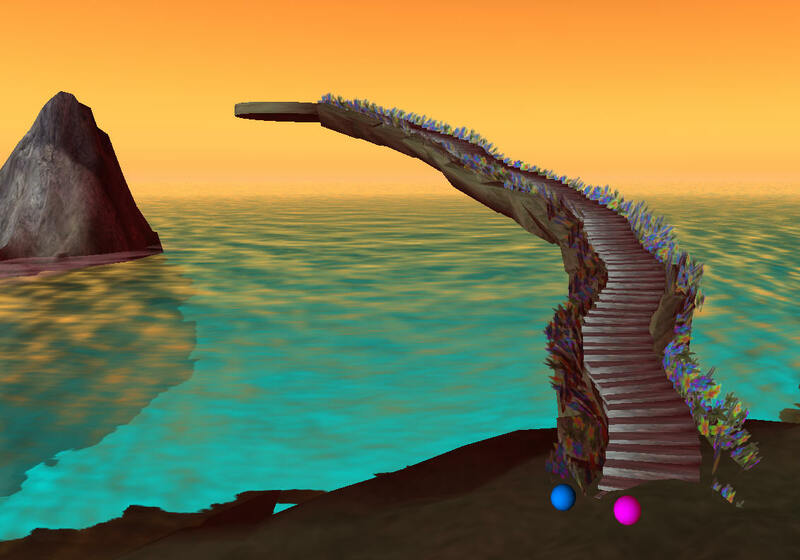 Link all the stairs and the bases together with the pose balls by selecting them all and pressing Ctrl-L. Shape and size does not matter. 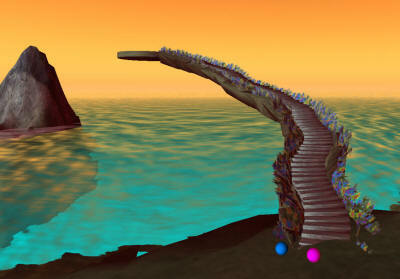 Now select the stairs and lastly, select the cube prim you just made, and link them together. It is important that the last prim that is selected is this 'last' prim. After it is linked the box should be visible with yellow outlines when you edit the system. 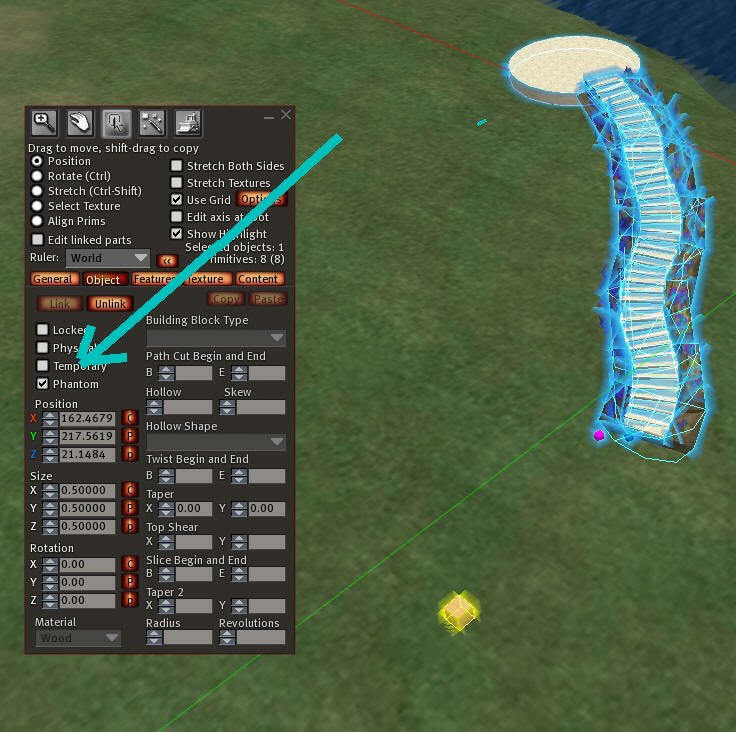 Now you can edit the single 'last' prim with Edit Linked Parts, and set the alpha for this prim to 100% so that it is invisible. This allows you to change camera below, above, spin it, and spaz it. This script can be put into any object, and when you sit on that object, you get the camera controls. Slide the entire system to the edge of your sim and rotate it into position. 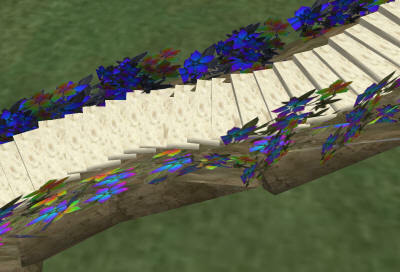 When anyone tries to walk up the stairs, they will be blocked by the sim edge. They then click the pose ball, and start to dance. They also get a menu to change camera view. Here is a weird bug: If you try to chat to the other person you are dancing with, you will not be able to hear them! IM will work, and you can shout at them, but you will not be able to type in normal chat and expect a response! My guess is that the system thinks they are more than 20 meters away, when you are both sitting on pose balls down next to each other, or animated next to each other. 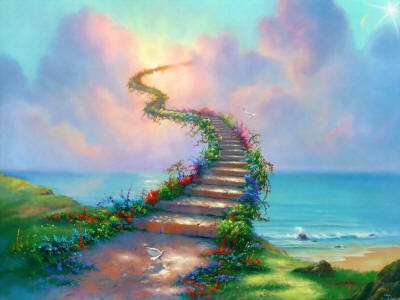 Okay, now you have a nice stairway to the stars. Now how can you generalize this and make it simpler? One answer will cost you an additional prim for each off-sim pose ball. Add a second pose ball, link it to the first, move them far apart, and put the script in the far away-off-the sim pose ball. Now adjust the offset in the script to a small number such as <0,0,0.1>. Do not set it all the way to zero as this will remove the sit position entirely. Why do this? It is very easy to move the far-off pose ball into position. It works just as well as the single pose ball with an offset trick described above. But it does cost you one extra prim.